A loom is a device for weaving threads for getting cloth. This machine produces fabric byinterlacing a series of lengthwise, parallel yarns width a series of widthwise parallel yarns. The development of this machine made cloth much more affordable and available to a greater number of people. It is only used for weaving. A hand loom is a simple machine used for weaving. In a wooden vertical-shaft looms, the heddles are fixed in place in the shaft. 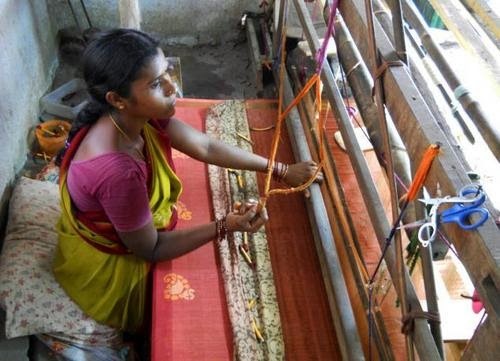 This loom is powered by hand. The warp threads pass alternately through a heddle, and through a space between the heddles (the shed), so that raising the shaft raises half the threads (those passing through the heddles), and lowering the shaft lowers the same threads—the threads passing through the spaces between the heddles remain in place. A power loom is a type of loom that is powered mechanically instead of using human power to weave patterns or thread into cloth. 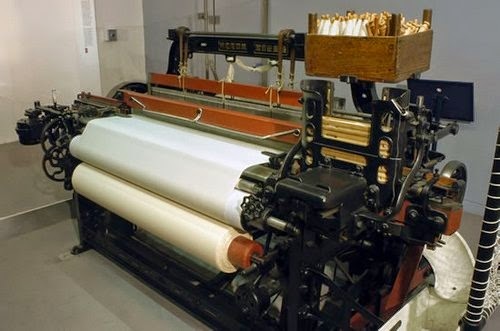 The power loom is an invention that combined threads to make cloth. Power looms were assembled in the weaving shed of a mill and driven by a steam engine by belts from overhead shafting. Power looms were a major advance over the hand looms used before. Normally one color fabric is produced.